February 4 , by Stacie Hooder. If you haven’t left a comment for your chance to win a free copy of Metal Clay Origami Jewelry, head over to the original post and do it now! PLEASE INCLUDE ME IN YOUR GIVEAWAY, I WILL REALLY APRECIATTE IT. 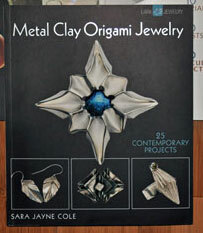 PLEASE I WANT TO WIN THE METAL CLAY ORIGAMI JEWELRY BOOK.